This afternoon we all set off for Tesco in Seaton, in pouring rain and a howling gale to play carols for the Christmas shoppers. However, we were able to pop into Pebbles for a bacon butty and a hot drink beforehand – thank you to the lovely staff there for looking after us so well. Thanks also to our dedicated collectors – Lynne’s husband, Ernie, and Sandra, our new Secretary, together with her gorgeous dog, Lilli, who has just taken over as our band mascot. 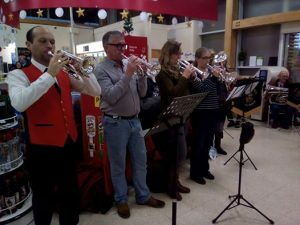 The store was very busy but we managed to attract a bit of audience participation which is always gratifying…thank you Tesco for having us! With best wishes to you and all your hard working staff from Lyme Regis Town Band.